While a cough is not usually a serious problem, coughing constantly can really get you down and disturb your normal activities. Coughing can disrupt your sleep and that of your family and make it difficult to focus on your work or studies. 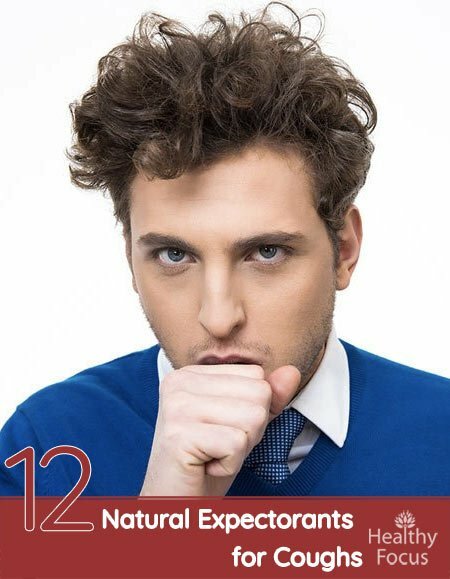 If you are suffering from a congested cough or wet cough, you can find relief in any number of natural expectorants. From herbs to oils, we are sure that at least a few of the remedies listed in this article can help alleviate your symptoms and have you breathing more comfortably. In plain English, an expectorant is a substance that will help thin phlegm and mucus and help break it up. When the mucus in the lungs is broken down, breathing becomes easier and the cough becomes far more productive. Natural expectorants will help relieve your symptoms but if your cough is frequent and more troubling. It is important to speak with your doctor to check if there are any more serious underlying causes. What are the Best Natural Expectorants? There are plenty of cough medicines available at your pharmacy but they are full of chemicals that may have adverse side effects. Fortunately, nature has plenty of answers to a wide variety of medical complaints and coughing is no exception. In fact, there are myriad natural expectorants that can help treat your cough. If you had a grandmother like mine, I am sure that you have tried plenty of them already. This list of natural expectorants is a long one but it is not comprehensive. Hopefully one or more of the remedies listed below will work for you but if you have a natural remedy that we have missed out, please tell us about it in the comments section. My grandmother’s favorite remedy for a cough and I am sure the favorite of many Grandmas the world over. Honey is absolutely delicious, antibacterial and incredibly soothing. It is full of goodness and can also help loosen up and thin out the nasty phlegm which has built up in your lungs. Simply adding a spoonful of honey to a glass of warm milk or herbal tea will do you the world of good. We use honey and milk whenever one of our daughters is suffering from a cough. They certainly prefer it to the taste of medicine and it is equally as effective if not more so. An alternative is to use your honey to make a chest compress. Rub a little honey onto your chest and then cover the honey with a cloth. Leave the cloth in position for at least 45 minutes. Licorice root has outstanding expectorant qualities but that is not all. Licorice can also help soothe an irritated and inflamed throat and also suppress your coughing. On a note of caution, it should not be used by people with high blood pressure. The best way to take licorice for your cough is in the form of a tea. Simply add half a teaspoon of licorice root to a cup of hot water, let it steep for ten minutes and drink it down three times each day until you feel better. Peppermint is a very popular flavoring ingredient in a wide range of products including toothpastes, gum, mouthwash and candy. It is also used to make a healthy tea while its oils are extracted to make a potent essential oil. Peppermint, which comes from the Mentha piperita plant, contains a potent compound called menthol. This compound can help thin out the mucus, loosen phlegm and help you breathe more comfortably. One of the best ways to consume peppermint is in the form of a herbal tea. This drink is regarded as safe and is available in ready made form in many stores these days. You can also make your own by simply adding a few fresh leaves to some hot water and letting it steep for a while. If you choose to use peppermint essential oil to treat your cough, there are a few precautionary notes to be aware of. Peppermint essential oil should never be taken internally. If you are going to apply the oil topically to your chest, you must always dilute it first with a suitable carrier oil like coconut or almond oil. Because peppermint oil is so potent, it is important to perform a patch test on a discrete area of your skin. Wait at least 24 hours to check for an allergic reaction before applying a larger dose. A simple hot steam treatment will help produce moisture which when inhaled can help to loosen mucous. Steam also calms down your coughing reflex and even soothes your sore throat. For even greater effect, add a few drops of essential oil like peppermint or eucalyptus to the water and inhale the soothing vapors. Steam alone can have a very beneficial effect but when you add essential oils to the mix, the effect is even more dramatic. There is a wide variety of choices that can help relieve your coughing. Many Essential oils have expectorant qualities. Some of the best for cough relief and to help you breathe more comfortably are clove, peppermint, rosemary and eucalyptus essential oils but there are many others. There are several ways to use your essential oils for their expectorant qualities. The easiest is to combine them with a carrier oil and massage the oil into your chest. Perhaps the most effective treatment is to fill a sink with steaming hot water and add 5 or 6 drops of your chosen oil. Put a towel around your head and shoulders. Lean your face over the sink and inhale the soothing vapors for 5 minutes or as long as you can tolerate. Be very careful not to scold your skin on the steam. Warm drinks, especially of the herbal variety can really help ease your breathing difficulties and clear mucus out of your system. Green tea, sage tea, and many others have expectorant qualities which can help treat your breathing and also fight off the viruses responsible for your symptoms. Sage makes for a great natural expectorant and it is very easy to make a soothing tea at home. Add a teaspoon of fresh or dried sage to a mug of hot water and let it steep for ten minutes. Strain the tea and drink it up several times each day. You may like to add honey to taste and since honey is an excellent expectorant in its own right, the combination of sage and honey should have you breathing more comfortably in no time. Studies have revealed that the leaf taken from the climbing plant – Hedra helix is a very effective expectorant that could help treat coughs and bronchitis. Experts believe that certain saponins found in ivy leaves help thin out mucous making it much easier to cough out of your system. Ivy leaf can be taken in tea form. You can find it these days at certain health stores and online. Fluids, in general, can help relieve your cold and warm fluids like chicken broth or soup can help get rid of the mucus in your respiratory system. Not to mention that it tastes great. Cayenne pepper is a spicy treat that can also help to loosen the mucus and phlegm in your lungs and respiratory tract. You can simply add cayenne pepper to your meals or add some of the spice to your tea and drink it down for immediate relief. Horehound is a well known herbal remedy for coughing because of its excellent expectorant abilities. It can also help suppress coughing and soothe irritations of the lungs and throat. It is thought to work due to the presence of a compound called marrubin which helps stimulate secretion in the bronchial system. Horehound is extremely bitter and is usually taken in the form of sweet lozenges or capsules. I guess taste is very subjective and not everybody appreciates the taste and smell of garlic as much as I do. Other opinions are available but for me, there are few more tasty herbs in the world. Lucky then that garlic is also an extremely healthy food with a growing reputation for its medicinal capabilities. As well as its many other benefits, garlic has expectorant qualities which can help clear your respiratory issues and treat your coughs. Eating raw garlic is a simple solution but may not appeal to everyone and you will have to make sure that you mask your breath afterward. It may be more palatable if you grate your garlic fine and add it to a tablespoon of honey. SSKI is basically a potassium iodide solution that is used for a range of medicinal issues. It was far more popular in the past but it can still be useful today. As an expectorant, SSKI can help thin out the mucus very quickly helping you to expel it fully from the system. Making sure that your body is properly hydrated ensures that it functions to its best ability. You should always increase your fluid intake if you have a cold or a cough. Drinking plenty of water, juice or herbal teas is a wonderful way to make sure that you are getting plenty of fluids into your system. Avoid drinking alcohol and too much caffeine especially when you have a cough or cold. Alcoholic drinks and caffeine have the opposite effect and will leave you more dehydrated. How do you get mucus out of your chest? There are a number of great natural remedies for thinning out the mucus that causes you to cough. By thinning out the mucus, you will be able to cough the stuff up more comfortably resulting in a reduced coughing and congestion. Some of the best home remedies include raw honey, herbal teas, peppermint, certain essential oils, steam treatments and garlic. What color phlegm is bad? Most of the time, mucus is nothing to be concerned about. however, if you produce yellow or green phlegm then it may be a sign that you are battling with an infection. Do expectorants make you cough more? Expectorants or antitussives work by reducing your cough symptoms and eventually the urge you have to cough. They usually encourage you to cough more but this is why they are effective. They actually promote the production of mucus while helping to thin it out and loosen it.This means your coughs can remove bacteria more effectively. Coughing caused by an upper respiratory infection like the cold is an extremely common condition. Coughs make up a large part of the work of many doctors and especially pediatricians. Expectorants work by loosening the mucus present in the chest helping your wet cough become more productive. Unfortunately, there have been very few studies into the effectiveness of natural expectorants for treating a cough. However, there is plenty of anecdotal evidence dating back centuries to suggest that many home remedies work very well. Hopefully one of the remedies we have covered in this article will work for you. However you should see your doctor if the coughing does not subside after two weeks to rules out a serious infection. Have you ever tried any of these natural expectorants to treat your congestion? Let us know how they worked out for you and if we should include anything else on our list.